can cause potential harm to a community’s health and environment if not handled with precaution. Waste that falls under this category requires special disposal and cannot be disposed of like common household trash or recycling. Household chemicals and cleaning products, such as pesticides, fertilizers, herbicides, detergents, degreasers, pool and hobby chemicals, and sprays, can be hazardous to our health and the environment. They can contaminate our groundwater, rivers and soil. They can have serious effects on human health if they are ingested, absorbed through the skin, or inhaled. How should they be handled? • Do not dispose of chemicals or cleaning products in the trash because liquid can leak from the trash truck onto the ground. • Collect and store them separately in a sealed and labeled container, away from heat sources, children and pets. The original container is best. • Clean up spills with an absorbent (kitty litter, shredded newspaper, vermiculite, rags, etc. ), then bag waste materials and discard in the trash. Dilute the soiled area with water. • Do not mix with other chemicals! Where Can I Recycle Chemicals & Cleaners? 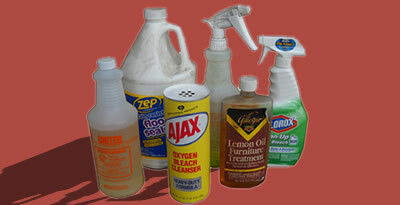 BuRRT – HHW Collection Center, Fridays & Saturdays from 8:00 a.m. – 4:45 p.m.
What about My Unused Chemicals & Cleaners? Most chemicals and cleaning products do not expire or go bad. Offer it to a neighbor or friend before you decide to discard it. What do I do with my Empty Container(s)? Household cleaner containers, such as Clorox bottles, window spray bottles, tile scrub bottles, etc, can be recycled if the container is plastic or metal, accepted in the local program, and is completely empty. Motor oil, paint, and other dangerous chemical containers cannot be recycled even if they are empty, and should be thrown in the trash.